Printed By – Tinsley Robor Group Ltd.
Made By – Tinsley Robor Group Ltd. Released on a ''pink rim'' Island label in a matte laminated fold-out cover containing the lyrics, and with a blue inner. "Cover printed and made by Tinsley Robor Group Ltd"
Bottom centre under island logo: "island records ltd basing street london w11"
hey guys I've got a version of this vinyl that i can't relate with any of the already submitted on the web! The label is the one with the pink ring (with the palm island) and 1972 printed. CAT number is ILPS 9184. 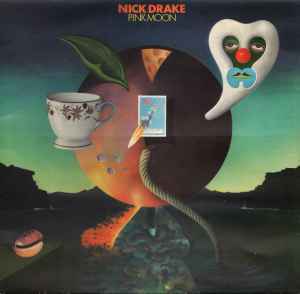 Gatefold cover with green lyrics on the inner left side and a negative portrait of nick on the inner right. At the bottom center of the cover's back there's an I (logo) with island records ltd - basing street london w11 under it. Printed and made by Tinsley Robor Group Ltd on the lower right. Info about it anyone? Heard this at the dentist today. Very strange. My dentist is actually pretty cool. Wallet stolen x2, never goes out of town because of having multiple kids + expenses, hates Trump. Really nice guy. Everyone hates Vancouver Washington, our town, but the people are actually pretty OK here even if don't fit in or whatever. They don't walk in the rain like the punx do and don't get their shoes wet... So no worry! I'm out in that 18 degree weather in January, frozen bones, ice, and streetlight punx. The vinyl label has a light pink colored circle on the outer edge and the Island logo is a cartoon with a palm tree with clouds in the background and blue and yellow rays. Anyone know if there is a way to tell if this is a reissue or possibly an original? Probably one of the most God-like folk albums of all time. Enough said.